The panel is set to start in a few minutes. While you’re waiting, Marvel Studios just launched Assemble.Marvel.com, the official site for The Avengers which features the new logo. Although the focus of the panel will clearly be on Thor, we hear that there may be some teaser footage of Captain America. We were handed 3D glasses which makes us think that some or all of the footage will in fact be in 3D. The crowd is starting to get impatient… the earlier delay due to the stabbing didn’t help. They’re starting!! Kevin Feige, Marvel’s President of Production, has come out first to introduce the two Marvel films for next summer. We’re starting with Captain America and they showed a great teaser for the movie which started with an air raid siren, which led to archival footage of World War II with famous quotes voiced over the top. We can see that there’s an alternating red, white and blue background as we see different scenes from World War II. The titles say… "In the world’s greatest (something), Our Courage and Strength Led Us Into Battle. Stories Emerged of Heroes, But One Story Has Never Been Told." The red, white and blue background slowly pulls back to show us that it is indeed Captain America’s shield. There’s a voice-over of Franklin D. Roosevelt saying "Today we must create the finest army in history, and every army starts with one man." "Next summer, meet the world’s first Avenger." Then we see the "Captain America" logo and the next shot has Captain America throwing his shield at the camera. Geoff Boucher then brought out director Joe Johnston, Chris Evans, and Hugo Weaving to talk about the movie and their characters. Kevin Feige told the crowd that the shots we saw was footage from the costume test. They’ve only been shooting Captain America for eight days, so Hugo Weaving says that he’s only spent one day in the Red Skull mask, but he didn’t want to do his German accent, but they then decided to show us the first footage that they shot last week, which looked fantastic. UPDATE: As promised, here is a detailed description of the scene that Joe Johnston shot on the first week of production, which involves Hugo Weaving’s character, the future Red Skull, looking for a mysterious artifact in an ancient tomb, presumably one that will lead to him becoming the Red Skull. As Weaving had mentioned during the panel, he hadn’t really been wearing the Red Skull mask as of yet, so this scene clearly introduces him when he was merely a Nazi soldier. The footage begins with a title card saying, "Norway, May 1942." The scene opens with two men inside what looks like a ancient tomb, and they seem petrified as the wall in front of them starts shaking and then crashing down as a bulldozer plows through it, piling rocks on top of the younger man. The older man starts taking some of the rocks off his downed companion when a bunch of German soldiers march into the room and throw the old man aside. "Remove the lid," one of them commands, and they go to a tomb of what looks like a Scandinavian Viking warrior, and four of the soldiers push open the lid as Hugo Weaving walks in as Johann Schmidt, wearing full Nazi officer attire, and he starts talking in his German accent—sounding a bit like Christoph Waltz in fact. "It has taken me a long time to find this place. I should be commended. I gave you nothing." "Get him up," he tells the soldiers referring to the old man, who he tells. "I think that what others see as superstition, you and I know to be a science." "What you seek is just a legend," the old man tells him. He says, "The Tesseract was the jewel of Odins’ treasure room" as he picks it up, but then he drops the cube onto the ground and it smashes to pieces. "It’s not something one buries, but I think it is close, yes." He continues as he walks over to one of the walls where there’s a raised etching of a large tree. "So…" he says as he starts reaching around the base of the wall. "Yggdrasil, the Tree of the World, guardian of wisdom, and fate also." He pushes a raised section at the base and pulls out a piece of the wall and he opens up what’s inside and a glow pours out of the item lighting up his entire face. "You’ve never seen this, have you?" he says to the old man. "It’s not for the eyes of ordinary men," the old man trembles in response. "Exactly," smiles Schmidt as his face is bathed in light and the scene ends. There’s a lot of interesting things we can learn from this scene, which play an important part not only in the origin of the Red Skull, but also how Captain America may tie in with Thor. The first is the existence of the Cosmic Cube this early in the Marvel Movie Universe and how it plays not only into the origin of the Red Skull, but how it may be connected to Odin (who is presumably the body in that tomb) and the Gods of Asgard. Chances are that this will be one of the few ties between the movies being that much of Captain America will take place in the ‘40s, but it could be setting up something much bigger down the road for The Avengers, maybe not in the first movie but certainly in a future one. UPDATE: Now, here is a more detailed description of the Thor footage we began to describe in our attempt to live blog the Marvel panel yesterday. As we mentioned before, the footage begins with a lightning crack that seems to be the running theme of the footage shown, which makes sense being that this is the God of Thunder and that creating lightning is one of his principal skills. We see an aerial shot of a S.H.I.E.L.D. base where Clark Gregg’s Agent Coulson is grilling Chris Hemsworth’s Thor, who is in handcuffs slumped in a chair. "One way or another, we find out what we want to know," he says. "We’re good at that. It’s not easy to do what you did." We see Thor breaking out of what seems to be a hospital but is more likely to be a S.H.I.E.L.D. containment center, throwing people around and throwing someone in a quarantine suit through the outside of a plastic containment area. "You make my men, some of the most highly trained professionals in the world look like a minimum wage mall cops," Coulson continues. We see Thor fighting more S.H.I.E.L.D. soldiers using a very physical way of combat, at one point jumping up and kicking a guy full on the chest with both feet. "In my experience," Coulson says. "It takes someone who received similar training to do what you did to them? Why don’t you tell me where you received that training." Pause. "Afghanistan? You strike me more as a soldier of fortune type." During this part of his interrogation, we see more of Thor fighting and a bunch of explosions. "Who are you?" He finally asks, and at this, Thor looks up at him from the chair. "I have sacrificed much to achieve peace. So too must a new generation sacrifice to maintain that peace. Responsibility, duty, honor," he proclaims loudly. "these are not mere virtues we must aspire. They are essential to every soldier and to every king," he proclaims. During this voiceover, the camera that’s been showing us glimpses of this Godly world finally enters Odin’s throne room as seen in recent pictures and the camera pans forward to Odin sitting in his throne, really holding sway over everyone in the room. Anthony Hopkins really looks well-suited to play a king in fact. As he speaks, we see some of the Norse Gods briefly including Sif, Balder and each of the Warriors Three. At the base of Odin’s throne is his son Thor. "Thor, for your arrogance and stupidity, you have opened these peaceful realms and innocent lives to the horror and the devastation of war." As that is said, we see our first look at Idris Elba’s Heimdall with fierce glowing eyes, as well as as bunch of other Asgardian creatures, presumably trolls, advancing on the camera. Odin’s voice starts to get louder and angrier, "You are a vain, greedy, cruel boy." Thor looks up and yells at him, "And you are an old man and a fool!" Odin responds to him, "Yes, I was a fool…. To think you were ready." This is when we first see Tom HIddleston as Loki who tries to intercede which just angers Odin more, but he’s now back to Thor again. "You’re unworthy and you’re a traitor! I now take from you your power. In the name of my father and his father before, I cast you out!" And as he says that, he sends a bolt of magical force at Thor sending him flying backwards out of the throne room and then through the stars, screaming as he crashes to earth in the desert. He’s found by Natalie Portman’s Jane Foster who looks at his prone body and says, "Please open your eyes." He does and seems perplexed, asking her in what seems like his normal Australian accent, "Oh, no, this is earth, isn’t it?" and she asks, "Where did you come from?" Yes, Thor has angered his father Odin so badly that he’s been exiled to earth sans powers, which is a very popular storyline from the comics, though not necessarily the same origin story told in "Journey into Mystery" #83 as we’ll learn later. We then see Hemsworth walking around shirtless (which got many girls in the audience to scream) and impressing Foster and her assistant Darcy (played by Kat Dennings) makes a comment, "You know, for a crazy homeless person, you’re pretty good." The next few scenes involve Thor and Jane Foster driving an RV through the desert and talking. "Describe exactly what happened to you last night," she says to him. "Your ancestors called it magic and you call it science," he answers. "I come from a place where they’re one and the same," he tells her. "We are on the verge of understanding something extraordinary," she says to him as they drive. "The answers you seek will be yours once I reclaim what’s mine," he tells her. We then see that they’re driving to the S.H.I.E.L.D. base and once inside, he pulls back a curtain to show where they’re holding Mjolnir, Thor’s hammer, after finding it in the desert at the end of Iron Man 2. Its business end is encased in a large thin piece of rock that had been cut away from the crater created by it dropping to earth. Thor tries to pull the hammer out of the rock, but as hard as he tries he can’t seem to get it out. This is something interesting to note, because Kenneth Branagh is clearly not going for the usual origin of Thor where Dr. Donald Blake finds a cane in a cave, strikes it on the earth and then changes into Thor. No, in this case, Thor has been exiled sans powers and without the strength to pull that hammer out of the rock, at least for now, which means he remains strong and well-trained in fighting, but still merely a very strong mortal. Odin’s voiceover says, "Whoever wields this hammer will be deemed worthy to possess the power of Thor." We’re then back to Asgard, where Loki is leading a group of Gods on some kind of march, but we also then see that Odin is lying prone on a slab, clearly having been killed either in war (or maybe through some trick of Loki?) leaving his kingdom of Asgard in need of a successor. A woman’s voice, presumably his wife Frigga, says, "The line of succession falls to you. Asgard is yours," and indeed, Loki says, "I am now the leader of Asgard. I am your king," as he casually walks up to the throne and the Warriors Three kneel before him. "For the first time in my life, I have no idea what I’m supposed to do," Thor says in voiceover and then we finally see him in his full costume as he battles with Loki. We also see a great shot of Thor standing on the throne with his hammer raised above his fight, another physical battle with Loki, in which he actually hurls Mjolnir at him and Loki blocks the hammer with his staff. There’s also a shot of Thor kissing Jane Foster, though we didn’t really see much of Sif, which was surprising. Throughout the footage, there are lots of lightning strikes used to great effect, the last one heralding the first official Thor logo. We do see and hear Odin one more time in the footage, as he’s standing in the shadows with another figure, his voice proclaiming, "He has disobeyed the expressed demand of his king. His fate is in his own hands now." The closing scene of the footage shows Coulson gathered with a bunch of agents in the desert, and we hear this loud booming noises which is shaking everything ala the T-Rex footsteps in Jurassic Park. Coulson looks up to the sky and we see something large drop to the desert sending sand everywhere. When the sand clears, we see it’s Odin’s destroyer, an enormous robotic construct not unlike the one from The Day the Earth Stood Still. "Is that one of Stark’s?" someone asks Agent Coulson, who responds, "I don’t know. The guy never tells me anything," he adds, and then says to the Destroyer, "Hello, you are using unregistered weapons technology, identify yourself." The Destroyer starts pacing towards the S.H.I.E.L.D. agents, and Coulson says matter of factly, "Here we go." and that’s when the eye panels on the Destroyer’s metal head opens up and starts shooting eye blasts out at the gathered agents, blowing up the agent’s cars off to the left and then the cars on the right and then the last blast goes right at the camera to end the footage. Couple observations about this version of Thor from what we saw in the footage: This is a far more physical character than maybe we’re used to seeing in the comics because we can tell that he can handle himself even without having his lightning powers or the use of Mjolnir. This is clear from the footage that shows him fighting S.H.I.E.L.D. agents which seems to be derived almost from the world of wrestling in terms of him jumping up and doing power kicks. There also seems to be more humor in this than some might expect from the normally serious Asgard stuff, and a lot of that comes from the earth characters like Clark Gregg’s Agent Coulson and Kat Dennings’ Darcy. It’s subtle humor but definitely in line with what Marvel Studios have done in their previous films. It seems like there will definitely be two very distinct sections of the movie, what’s happening in Asgard and what’s happening on Earth, although we expect the story will go back and forth between them. The Asgard stuff certainly seems more like things we’ve seen in the comics, while the earthbound stuff is more in vein with what Marvel Studios has set up with the two "Iron Man" movies. One interesting note is that we don’t really see Thor on earth in his full costume, as if he is more human on earth, figures out how to get a hold of his hammer and then returns to Asgard to face the repercussions of Odin’s defeat and Loki’s rise to power. One presumes that eventually he’ll have to get back to earth in God form, so that he can join the Avengers, although there really wasn’t any indication of how and when that happens from the footage. Clearly, part of the story as we know from Coulson’s appearances in Iron Man 2 is that when Thor is cast down to earth along with Mjolnir, they’re both found by S.H.I.E.L.D. and detained, then Thor escapes and hooks up with Jane Foster (at least figuratively) and they try to get Thor’s hammer and powers back. Meanwhile, Asgard has been thrown into chaos due to war and the death of Odin, allowing Loki to take power. At least the latter stuff is very much from the comics, while the S.H.I.E.L.D. aspect is very much a way to tie Thor in with the other planned movies. 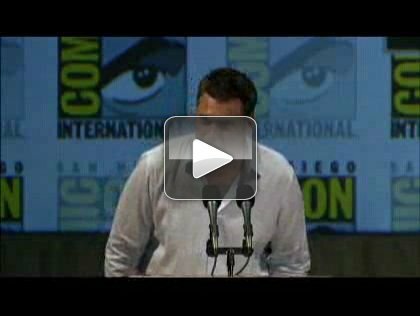 Before the cast of Joss Whedon’s The Avengers came out on stage to close the panel, they showed a brief teaser for the movie, and, we wanted to share the full voiceover by Samuel L. Jackson as Nick Fury. He says, "And there came a day, a day unlike any other. When earth’s mightiest heroes found themselves united against a common threat that no single superhero could withstand. On that day… the Avengers were born." 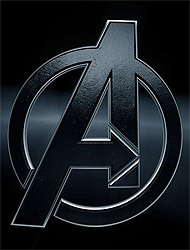 This teaser essentially led up to the first logo for The Avengers, and after it ended, Jackson was introduced and he brings out Clark Gregg, Scarlett Johansson as Black Widow, Chris Hemsworth as Thor, Chris Evans as Captain America… and then Robert Downey Jr. came out as Tony Stark and the crowd went crazy. Downey Jr. then talked about how people were saying how Inception was the most ambitious movie ever made, but Downey said that bringing together all of these heroes for The Avengers was the most ambitious movie. He then introduced and confirmed that playing Clint Barton is…. Jeremy Renner… and "reprising his role as Bruce Banner… Mark Ruffalo!" He then brought out director Joss Whedon, who said that he had always had a dream, presumably about directing The Avengers, "but my dream was never this good!" We may add more to this article soon, since there was some cool stuff said on the various panels, but just to quickly recap, we got the first teaser for Captain America as well as some of the footage they shot in the first week, an extended bit of footage from Thor, a teaser for The Avengers, essentially just the logo with a Samuel L. Jackson voice-over, and then they brought out the entire cast and director of The Avengers, including all of the actors already introduced and adding Jeremy Renner and Mark Ruffalo as Clint Barton/Hawkeye and the new Bruce Banner/The Hulk. 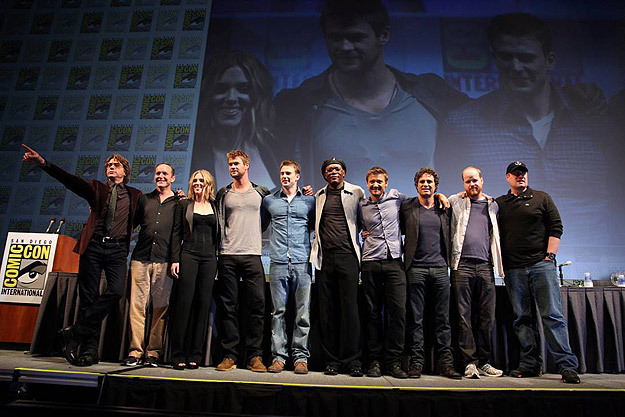 Here’s a photo of the Avengers on stage. You can click it to view a bigger version!